the turn it moved onto battlefield it blew away Zee German Wirbelwind and spread terror among units around. Next turn the game was over. Yeah, yeah... It was nothing but the matter of luck but still model looks damn cool and brings lots of fun (mostly for US player) so I hope to include it in army lists frequently. 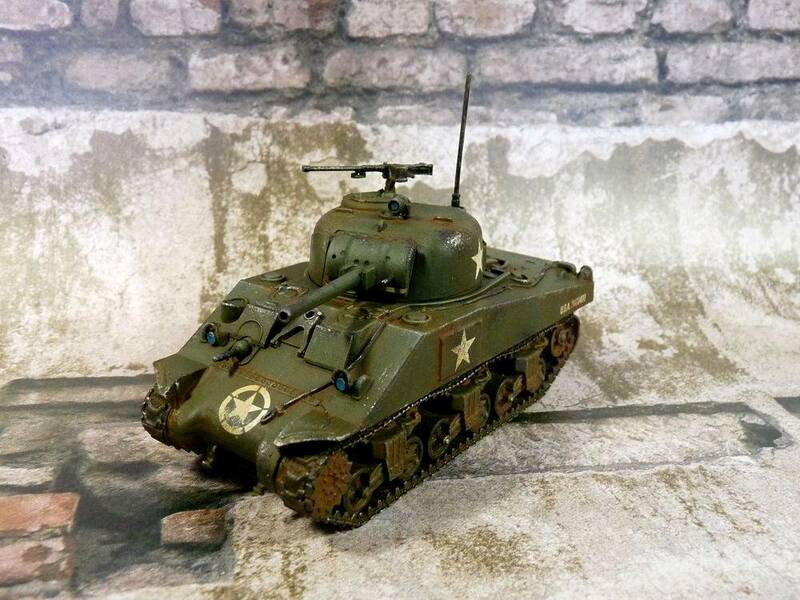 Sadly I don't have enough space to keep all models I've ever got so instead of purchasing another Sherman decision was made to upgrade model I've already had finished with Warlord's Calliope missle launcher set. While working on the model some pics were taken about both assembling and painting, which hopefully might be useful for fellow hobbyists. T34 set contains like 5 parts which could be assembled and attached with greenstuff and superglue, but since it's gaming model (often transportation) I decided to pin it to the turret. Just to minimalize risk of damage while getting to battlefield. Assembled - still without glue. instead of painting model with airbrush and then working on shading, dark areas were painted before base color. Idea was to simply leave these "natural" shadows, making model look more realistic. It was actually supposed to be much brighter but nozzle in my airbrush got fucked and is started spitting paints. Visible especially on the turret. And another new thing for me: oil paints. I've heared lots about this stuff and recently got few colors to see what's all about. Using oils is way different that standard acrylics but works great on vehicles. And final details: tools, streaks, mud effect on the tracks. The model is done: me likey. Very nice work there mate - a great final model. And there's nothing stupid about what you did with the shading - it's a well established technique called (I think) pre-shading where you add the shade as you did, and even highlights before the base coat. I've had fun with oil washes myself, though they can take (quite) awhile to dry being their only drawback really. Yours have come out very nicely!